When I heard from a reader of this column that a thick locked door in the corner of a classroom in Brighton College was perhaps somewhat more than a stationery cupboard, which its appearance suggested, I had to investigate further. 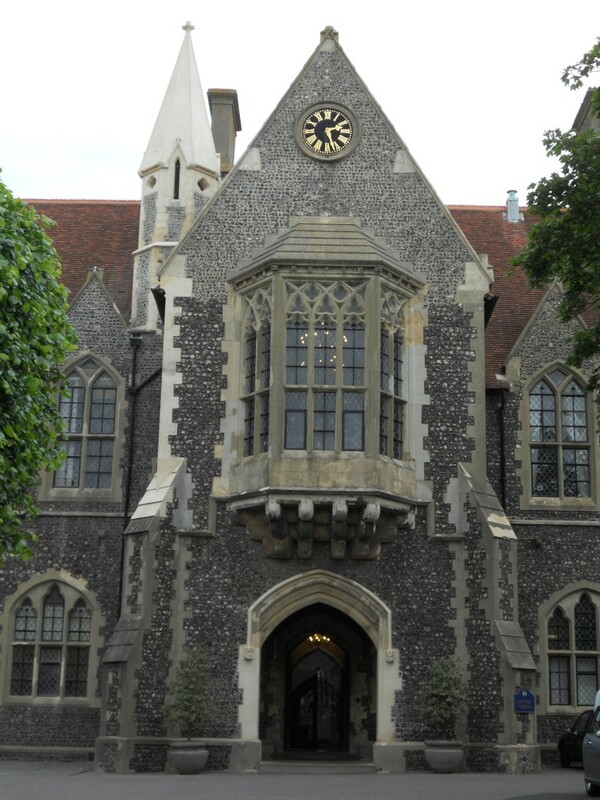 Brighton College’s Head of Security, Pat McCarter, took our little group from reception through to a fairly standard classroom on the ground floor of the grand flint building which occupies the north side of the College’s famous quadrangle. The room is apparently used for Classics, and detentions. As soon as the mysterious door was unlocked, I knew that we were in for a treat. A tight spiral staircase could clearly be seen to twist upwards, into the dark above. Four of us ascended the 50 or so narrow stone steps with me at the rear. With hindsight, this was unwise as it was always going to be me who would be exploring whatever we found at the top. I guess that we assumed that it would open out, but instead the steps simply became a tall wooden ladder. I squeezed past the others and started climbing – from the dark, into a bright chamber at the very top. The octagonal room, with eight windows – four wide and round, four arched and narrow – contained a large bell. Its green tinge suggests copper content so it is presumably bronze. Ropes hang down, past the ladder, and through circular holes in some of the steps so that the bell can be rung from the ground. From outside, it was clear that we had been up inside a slim angular protrusion jutting out of the aforementioned flint structure. The foundation stone of the building was laid in 1848 and its architect was Sir George Gilbert Scott, who was also responsible for the Midland Grand Hotel at St Pancras. It is clear that a serious amount of work has recently gone on to repoint between the flints and to replace and clean much of the masonry, including many of the stone quoins. Halfway up the spiral staircase is a door that apparently leads to the library. But that room served as the chapel until a dedicated structure was built nearby. 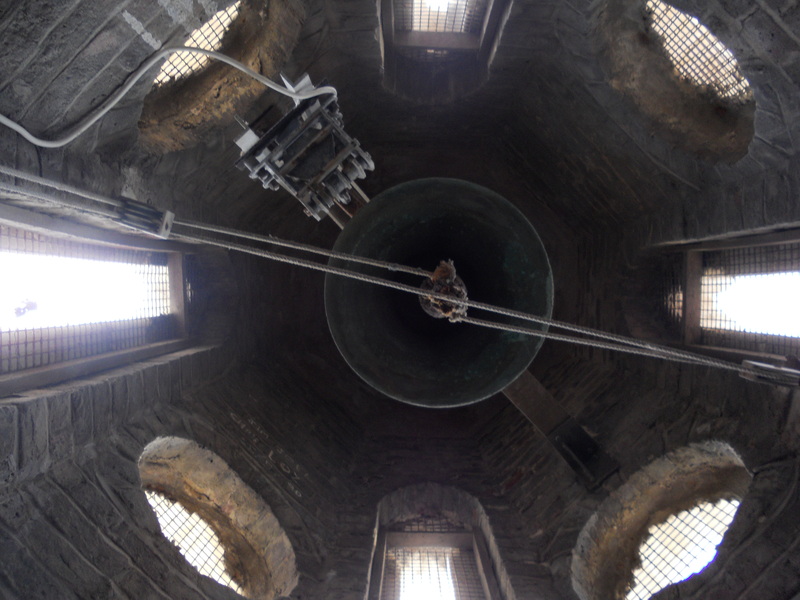 This is no doubt connected to why the tower is called the Chapel Bell Tower. Thanks to Lucy Bidwell for telling me about the door, and to Ed Allison-Wright and Rebecca Findlay for giving the tour.